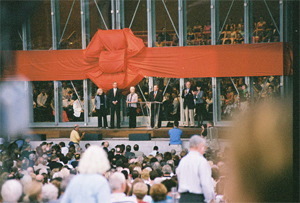 Millenium Park opens with a three-day celebration that included an inaugural concert by the Grant Park Orchestra and Chorus. 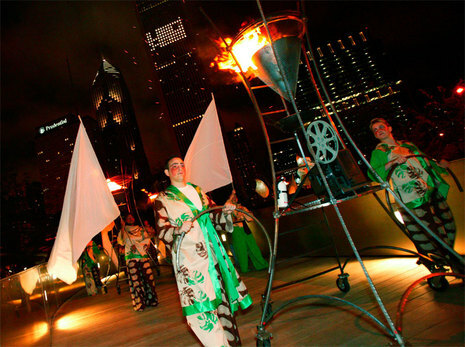 300,000 people took part in the grand opening festivities. 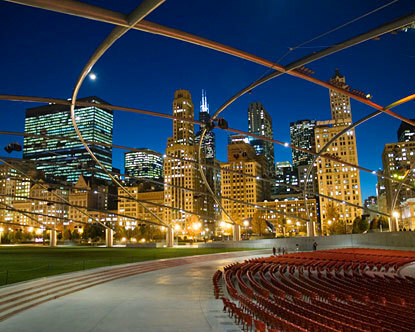 The park features the Cloud Gate, Crown Fountain, Jay Pritzker Pavilion, Lurie Garden and other attractions. The park is connected by bridges to other parts of Grant Park (BP Pedestrian Bridge, Nichols Bridgeway). 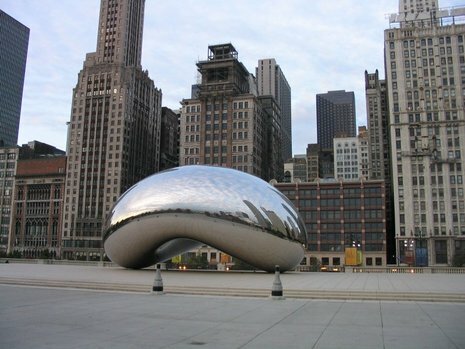 The architect can call it what he wants, but the people of Chicago have spoken: The silver legume-shaped sculpture in Millennium Park is now and forevermore the Bean. With the official opening today of Mayor Daley's long-delayed, way-over-budget dream project, the critics will have their say about its aesthetics and functionality. Here, too, the people will have the final word. We think it will be "fun." That's not a word we've heard much in discussions of Millennium Park, and not just because of concerns about its great expense. In a city with Chicago's architectural history, there's a lot of pressure to live up to its vaunted standards. 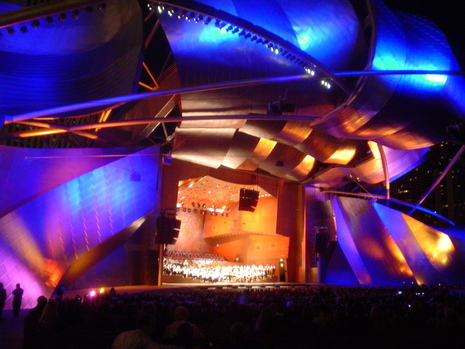 Will Frank Gehry's hydralike music pavilion one day be discussed in the same reverent tones as the works of Wright and Sullivan and van der Rohe? After spending $475 million in taxpayer and donor money -- $325 million more than originally planned -- will the City of Chicago be better off culturally than it was? Couldn't those millions have been better spent? To be sure, during the ongoing budget crisis, health and social services would give anything for a fraction of the $270 million in taxpayer funds spent on the project. But it can be argued that you can't put a monetary value on public works that enhance the image and quality of life of a city. In so doing, they stand to draw huge numbers of city and suburban dwellers downtown to reclaim some of the communal urban experience that has been lost and to draw people from outside Chicago to marvel again at the vision and cultural reach of this architectural First City. Cities are defined by progress as much as history. It is the function of architects and other artists to reflect both of those aspects of their identity -- and, in so doing, declare their will and wherewithal to push into the future, no matter what dark threats may be gathering on the horizon. 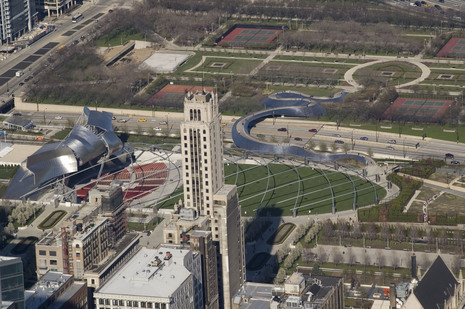 Like Soldier Field, another huge and controversial undertaking that forced people to rethink their notions of Chicago's ties to tradition, Millennium Park is about user-friendliness as much as urban expression. It invites people to stroll and bike and picnic, to sightsee in a breathtaking new way. To gaze at the skyline as it reflects off the Bean -- OK, "Cloud Gate" -- is to reclaim its sense of wonder. 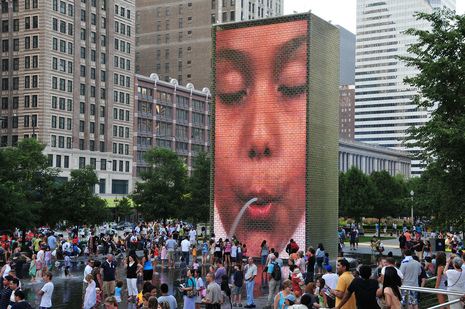 To study the faces of actual Chicagoans digitally captured on the two 50-foot glass-brick towers in the Crown Fountain is to reflect on the city's rich ethnic mix. As for the band shell, we count on the music sounding as good as the structure looks in setting off the highrises behind it. Even with all its finishing touches in place, the park won't be perfect. But considering the burst of energy and new life it will bring to the city, any flaws will shrink in importance. The mayor has taken a lot of guff for seeing this project through, in the face of galling criticism. Now is the time to congratulate him, again, for standing by his vision of and for Chicago. 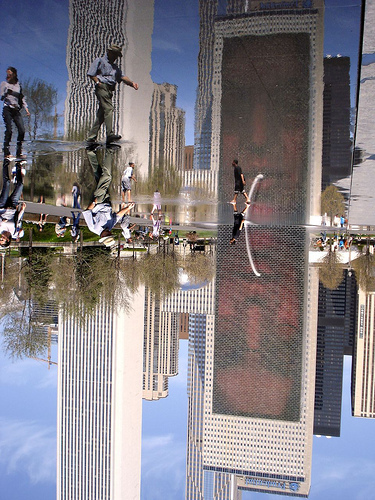 Chicago's Millennium Park is already a visually busy place, full of eye-grabbing architecture and sculpture from Frank Gehry's Pritzker Pavilion to Jaume Plensa's Crown Fountain to Anish Kapoor's "Cloud Gate," popularly known as the Bean. The Lurie Garden, nestled in the park 's southeast corner, makes a quieter statement, but don't let that fool you. 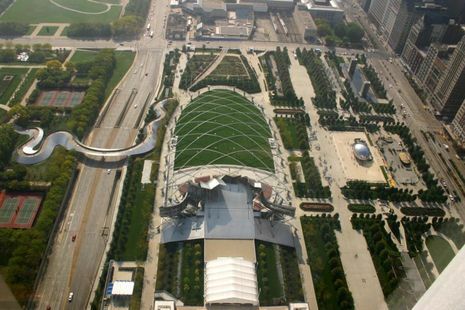 The 2.5-acre garden, spearheaded by Seattle-based design firm Gustafson Guthrie Nichol Ltd., makes a strong claim as one of the signature elements of Millennium Park (which officially opens Friday) even as it offers a respite from the visual barrage of the rest. "The team created this wonderful garden experience," says Millennium Park Project Design Director Ed Uhlir, who describes the Lurie as "an oasis in Millennium Park and certainly an oasis in the city." Or as the design team's Shannon Nichol puts it, "When you're inside, you really feel like you've been transported into another sort of interior that the city floats around -- these green horizons of the shoulder hedge. And then when you're outside, it's very much about these linear sweeping connections of the bigger park ." A recent tour of the $13.2 million garden revealed an impressive though still-rough palette of unplanted shrubs, newly poured cement and one massive but gradually diminishing pile of mulch. Beneath a blazing noontime sun, scores of workers buzzed about, sweating (literally) scads of last-minute details. Initially, many of the 240 perennial varieties stategically installed by world-class planting designer Piet Oudolf to bloom at different times of the year (a total of 36,000, both regional and exotic, blanket the grounds) won't be visible. Even so, thousands of plants, groves of trees, 14 kinds of clipped hedges, dramatic lighting, and shallow water pools will offer idyllic buffering from the surrounding big-city bustle. 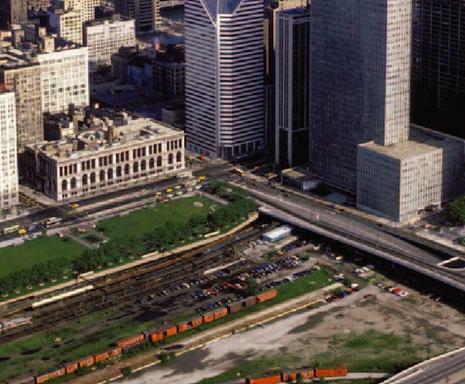 Originally dubbed the "Shoulder Garden" for its brawny and defining shoulder hedge (a nod to Carl Sandburg's characterization of Chicago as "the city of big shoulders" and a visual base for the Pritzker), it also serves the functional purpose of directing foot traffic to underground parking entrances. Before philanthropist Ann Lurie donated $10 million to the project, it went through some conceptual metamorphoses early on. Once little more than a forgettable place-holder slated to house the Kapoor sculpture (which was later moved to a different location in the park ), it's now a complex artistic entity unto itself, rife with metaphorical meaning and a sense of local history. Perhaps most striking are the contrasting "light" and "dark" halves of the garden, divided by a boardwalk -- one half ethereal and abstract, the other verdant and textured -- that symbolize Chicago's evolution from largely immersed and barely navigable marshland to something solid and open. "I think our work derives much of its inspiration from where we are," says lead designer Kathryn Gustafson. "So it's very site-specific." Gustafson, who created the recently dedicated Princess Diana memorial fountain in London's Hyde Park , was selected from a pool of 11 competitors by a panel of experts, including landscape architects, architects and specialists from the Morton Arboretum and the Chicago Botanic Garden. Gustafson's focus on the Lurie's floral component, coupled with her decision to join with collaborators Oudolf and Robert Israel, gave her the winning edge. 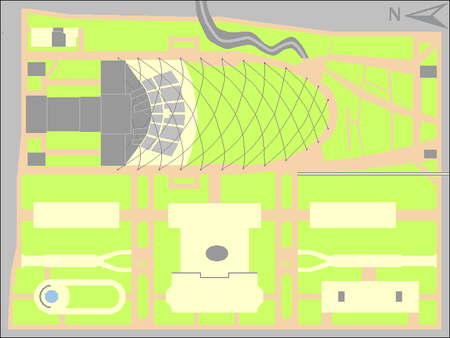 In addition to its more obvious traits, the multilayered space is purposely tilted southward, toward the neighboring and elevated Art Institute of Chicago. From the museum's upper levels, the Lurie will appear as a living, ever-changing painting. For all its external beauty, however, the garden is best experienced from within. "We can't just put something down that you look at from outside," says Nichol. "We want the landscape to be something that you experience as you move through. And it changes or tells a story in one direction or another. It should look different from any place you stand within the landscape, and it should do that in a way that relates to its context." Adds Gustafson, "When we set out in the beginning, we looked at the entire Millennium setup and tried to figure out classically what was full, what was empty, how do you balance out the spaces. 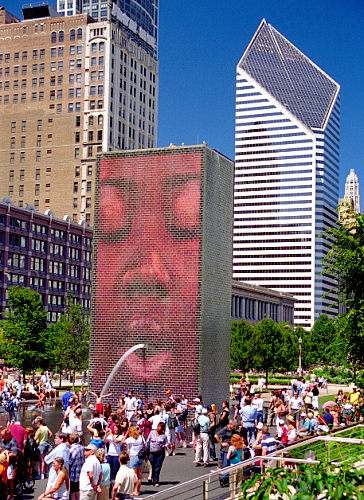 And with Gehry's Great Lawn, one of the first instincts was, this piece needed to be full so that the people would get diverse experiences as they moved through." And they surely will -- in droves. in the fire towers landed on the material.